The Via Francigena or Camino to Rome takes pilgrims across some of Europe’s most stunning regions, including Tuscany in Italy. The Via Francigena crosses Tuscany, taking walkers from the Passo della Cissa mountain pass in the Appenines to the Val d’Orcia. However, the section from Lucca to Siena remains the most popular stretch of the Camino do Rome, the Via Francigena in Tuscany. While walking in Tuscany, you will be rewarded with wonderful picture-perfect landscapes: lush fields dotted with terracotta farm houses, vineyards that stretch for miles and rolling hills topped with vertigo-defying castles and medieval villages. Your taste buds will also be pleased to be treated to the superb local food and wine after your walk: Tuscany is the land of Chianti, white truffles and an immensity of delicious cured meats. Besides all that, these are some of the most spectacular places you will find while walking the Via Francigena in Tuscany. Lucca is the starting point of our most popular section of the Via Francigena. While this section’s most stunning part starts once you reach San Miniato, Lucca is a city that shouldn’t be missed, even if you decide to start your walk further ahead. 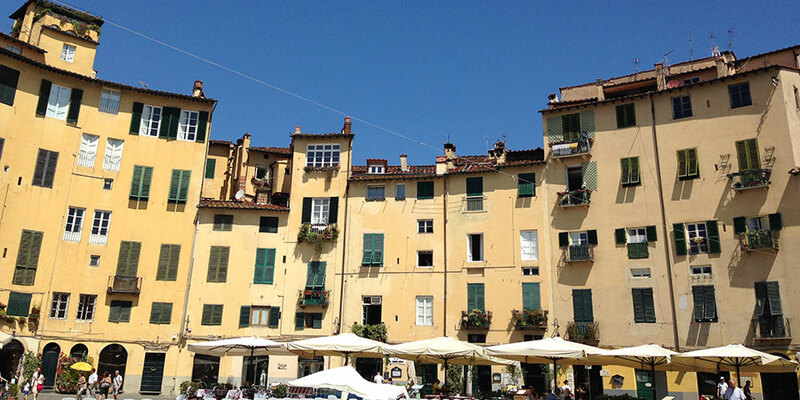 Lucca’s most striking feature is its 16th century 4km-long wall, wrapping itself all around the old town. The wall is perfect to go for a jog, a walk or a cycle. Inside the wall, explore its cobbled streets and piazzas, admire the San Martino cathedral or simply relax and watch the world go by with a cup of coffee or a gelatto. Lucca is also the home place of composer Puccini. The city hosts an important music festival every summer, that honours its musical tradition. 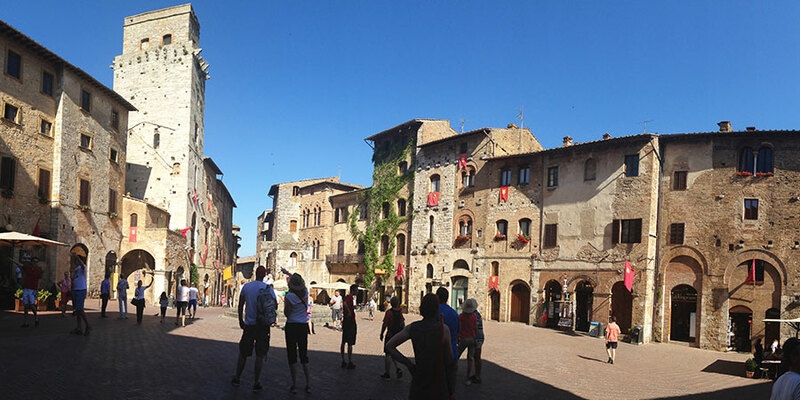 As you approach the end of your walking day, the 14 medieval towers of San Gimignano will come into view. It is an impressive and imposing sight for Via Francigena pilgrims arriving in ‘San Gimignano delle belle Torri’, San Gimignano of the beautiful towers on foot. This now UNESCO-listed hilltop town was once controlled by two rival families who built 72 tower houses, as a symbol of their wealth and always trying to outdo each other. 14 of those towers remain (of up to 54 metres), giving the town its unique medieval look. It is also believed, it was this rivalry that gave Shakespeare his idea for the plot of Romeo and Juliet. Monteriggioni is small in size but makes a big impression.This tiny village was an important walled castle and remains intact since the 13rd century, welcoming pilgrims into its central square where you will find the Church of Santa Maria Assunta and a couple of cafes where you can relax. You can also take a tour of the walls to enjoy panoramic views of the region. Each July, Monteriggioni is also host to a Medieval Festival, one of the most impressive in the region. UNESCO-listed Siena is one of Italy’s most visited cities and for a good reason. The historic centre of Siena is listed as a UNESCO site for its amazingly preserved medieval structure and Gothic architecture, built around the central Piazza del Campo. 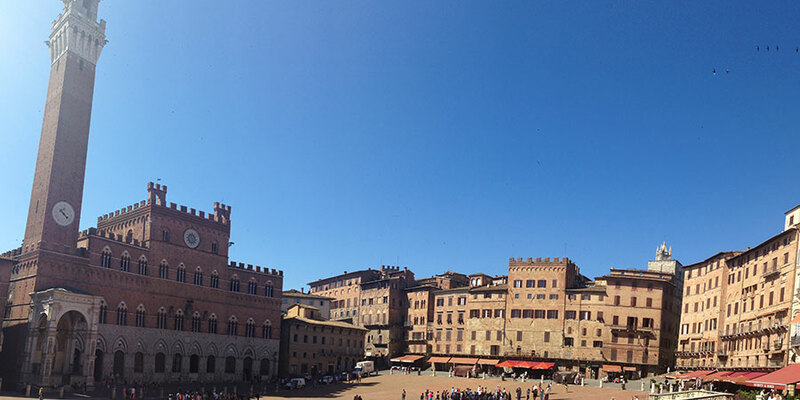 This curved square is home to the Palazzo Pubblico and its tower, as well as hosting the heart-stopping Palio di Siena horse race in July and August. The classic Tuscan cathedral, or Duomo, and the Museo Civico are also a must-see in Siena. After Siena, the Via Francigena enters the Val d’Orcia, a UNESCO-listed region of outstanding natural beauty and landscapes carefully designed in the Renaissance. 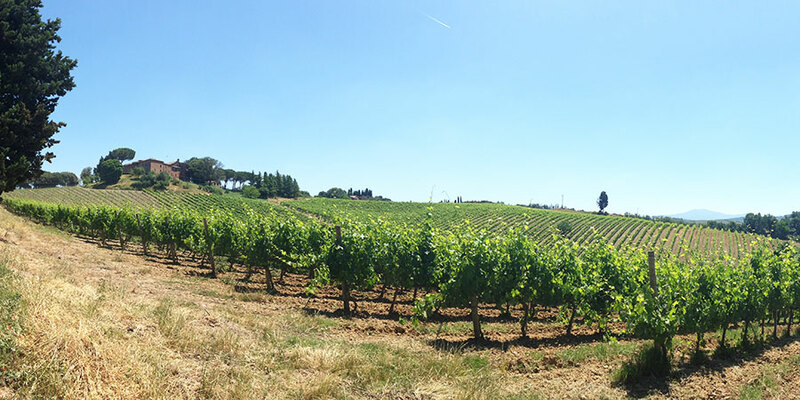 Here you will find the classic Tuscan white tracks weaving paths among the ever-stretching vineyards. Peaceful farm houses lined by cypress trees, hilltop castles and medieval villages dot this historic and idyllic countryside. At CaminoWays.com we can advise on the best sections for your trip and your holiday can be completely tailor made and adapted to the time you have available. Our travel specialists will be able to advise on different starting points along the route. For more information about the Via Francigena, the Camino to Rome or to book your walking holiday in Tuscany, contact our travel specialists. Hi Irene, thank you for your enquiry. I will pass along your details to our travel team who will send you more information on the Camino tour from Tuscany. Kindest wishes, Lisa from CaminoWays. Hi Gayle, thank you for your message. Yes, we offer self-guided cycling tours on most of our routes. The cycling section along the Via Francigena in Tuscany is fantastic. If you would like an itinerary for one of our cycling tours you can contact our sales team on info@caminoways.com and visit the following link to the cycling section of the Via Francigena in Tuscany – https://caminoways.com/ways/camino-to-rome-via-francigena/via-francigena-in-tuscany/vf-tuscany-181/book Best wishes, Lisa.